145 Beacon is located on the south side of Beacon, between Arlington and Berkeley, with 143 Beacon to the east and 303 Berkeley (147 Beacon) to the west. 145 Beacon was built ca. 1861, one of two contiguous houses (143-145 Beacon) built at the same time as a symmetrical pair, with 145 Beacon four feet wider than 143 Beacon. 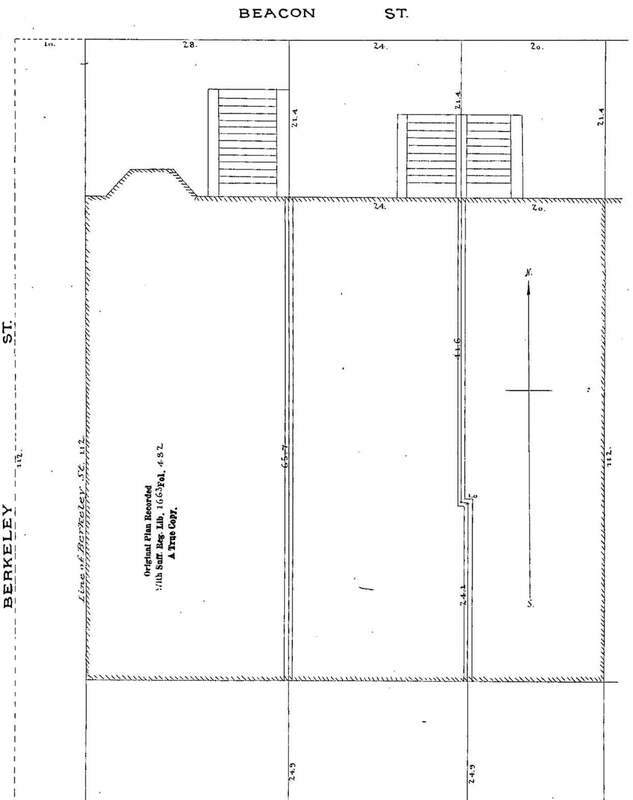 The party wall between the two houses has a one foot jog to the east so that the frontage of 145 Beacon is 24 feet on Beacon and 25 feet on Alley 421. Click here for an index to the deeds for 145 Beacon. By 1863, 145 Beacon was the home of John Lowell Gardner’s son-in-law and daughter, attorney Joseph Randolph Coolidge and Julia (Gardner) Coolidge. They previously had lived at 7 Beacon with her parents. From mid-1868 through mid-1871, the Coolidges were traveling in Europe; their son Harold was born in Nice, France, in January of 1870. In 1869, 145 Beacon was the home of banker Hollis Hunnewell and his wife, Louisa (Bronson) Hunnewell. They previously had lived at 59 Beacon. They traveled to Europe in the fall of 1869, after which they moved to their newly-built home at 315 Dartmouth. In 1870, 145 Beacon was the home of Mrs. Ellen (Lamb) Treadwell Stetson, the widow of George Treadwell and of Joshua Stetson, who had died in July of 1869. Prior to his death, they had lived at 29 Commonwealth. Ellen Stetson lived at 145 Beacon while her new home at 33 Marlborough was being completed. She had moved there by 1871. In 1871, 145 Beacon was the home of Robert Charles Winthrop and his wife, Cornelia Adelaide (Granger) Winthrop. They previously had lived in Brookline, where they continued to maintain a residence. Robert Winthrop was President of the Massachusetts Historical Society, a former Speaker of the US House of Representatives, and a former US Senator. By 1872, they had moved to 88 Marlborough. The Coolidges returned from Europe in August of 1871. They resumed living at 145 Beacon for the 1871-1872 winter season, and continued to live there through the 1875-1876 season. 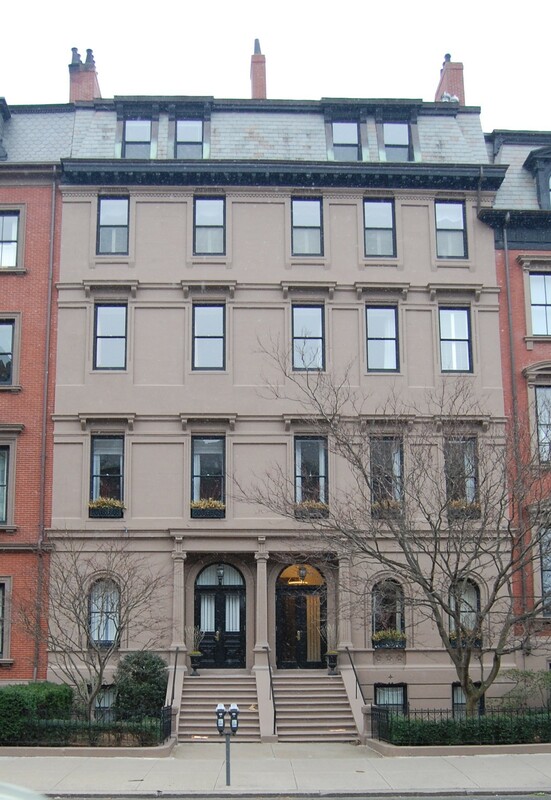 In November of 1876, they moved next door to 147 Beacon (303 Berkeley), which had been the home of Julia (Gardner) Coolidge’s brother and sister-in-law, Joseph and Harriet (Amory) Gardner. 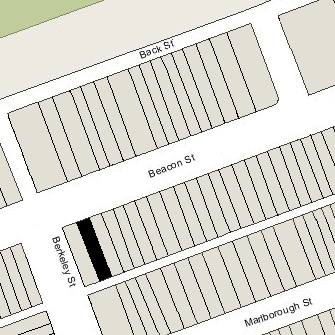 By 1878, 145 Beacon was the home of Nathan Matthews and his wife, Albertine (Bunker) Matthews. They previously had lived at 12 Arlington. They also maintained a home in Bar Harbor. Nathan Matthews was a real estate investor, formerly president of the Winnisimmet Company, which developed portions of Chelsea, and (between 1860 and 1870) president of the Boston Water Power Company, which developed portions of the Back Bay. Nathan and Albertine Matthews continued to live at 145 Beacon. In 1888, they traveled to Europe, remaining eighteen months. During the 1888-1889 winter season, 145 Beacon was the home of wholesale dry goods merchant Samuel Bradford Dana and his wife, Katherine Wallen (Lyon) Dana. They previously had lived in West Roxbury. By 1890, the Danas had moved to 128 Marlborough and 145 Beacon was once again the Matthews’s home. Nathan Matthews died in August of 1904. 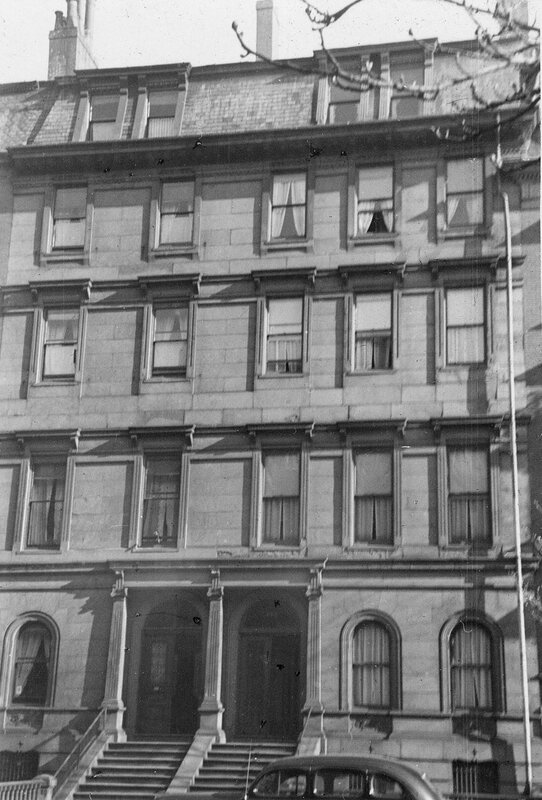 After his death, Albertine Matthews moved to 456 Beacon to live with their son and daughter-in-law, Nathan Matthews, Jr., and Ellen Bacon (Sargent) Matthews, and then to the Hotel Vendome, where she was living at the time of her death in December of 1907. By 1905, 145 Beacon was the home of note broker Walter Abel Underwood and his wife, Angie Eleanor (Ellis) Underwood. They previously had lived in Brookline. They also maintained a home in Cohasset, which had become their primary residence by 1906. By 1906, 145 Beacon was the home of Dr. William Lothrop Edwards, a physician, and his wife, Alice (Loring) Edwards. In 1905, they had lived at 125 Beacon. They continued to live at 145 Beacon in 1907, but by 1908 had moved to 33 Gloucester. On April 12, 1907, 145 Beacon was acquired from William A. Gardner and Augustus P. Gardner by Mary Wallingford (Herrick) Dame, the widow of liquor dealer Frank O. Dame. She lived at 459 Marlborough during the 1906-1907 winter season and moved thereafter to Brookline, where she died in June of 1908. She does not appear to have lived at 145 Beacon. 145 Beacon was not listed in the 1908 and 1909 Blue Books. On April 17, 1908, 145 Beacon was acquired from Mary Dame by Thomas Dennie Boardman, a widower, and his two children, Madeline (Madeleine) (Boardman) Goodrich the wife of John Wallace Goodrich, and Reginald Boardman. T. Dennie Boardman was a real estate and mortgage broker and former leather merchant. Reginald Boardman was a member of his father’s firm. J. Wallace Goodrich was Dean of the New England Conservatory of Music. They all previously had lived at 244 Beacon. On January 16, 1911, T. Dennie Boardman acquired his son’s interest in 145 Beacon, probably in anticipation of Reginald Boardman’s marriage the next month to Carrie Louise Munn. After their marriage, they lived in Manchester. T. Dennie Boardman died in September of 1919. Madeline Goodrich and Reginald Boardman inherited his interest in 145 Beacon. The Goodriches continued to live there during the 1920-1921 winter season, but moved thereafter to 319 Dartmouth. On June 15, 1921, 145 Beacon was acquired from Madeline Goodrich and Reginald Boardman by Adelaide Chatfield (Taylor) Whitman, the wife of Hendricks Hallett Whitman. They also maintained a home in Beverly. They had lived at 18 Chestnut earlier in 1921, and at 338 Beacon in 1920. Hendricks Whitman was a textile manufacturer and wholesale dry goods merchant in his father’s firm, and also president of the Katana textile mills. They continued to live at 145 Beacon in 1924, but in 1925, were living at 99 Pinckney and 145 Beacon was the home of architect James H. Robb (who may have been remodeling the house for the Whitmans). By the 1925-1926 winter season, the Whitmans were living at 145 Beacon once again. They continued to live there during the next season, after which they made Beverly the home. On August 6, 1928, 145 Beacon was acquired from Adelaide Whitman by Euphemia E. McClintock. After acquiring 145 Beacon, Euphemia McClintock converted it into a dormitory for Erskine School. In May of 1935, she acquired 303 Berkeley (147 Beacon), and in July of 1935, she filed for (and subsequently received) approval to combine the buildings, cutting through openings in the party wall on several floors. The buildings continued to be used as a dormitory and dining room for residents of the building. Erskine School continued to occupy 145 Beacon – 303 Berkeley in 1946, when it suffered a fire of sufficient seriousness that it required the building to be entirely vacated.